Nelson's Point of View: Work, leisure and sleep – can we have them all? Work, leisure and sleep – can we have them all? According to my friend Alex, it is possible. Many of us wish that we have 48 hours a day to do the things that we want to accomplish. We always find our time being limited and insufficient, and that we have to sacrifice our sleep and leisure time in order to finish our work. Given that work is a top priority for survival (unless you have plenty of cash to spare), we often indulge ourselves in leisure after a hard day of work to unwind - a few hours after dinner to catch a movie, have drinks with friends, read a book or surf online. The net result is that we sacrifice sleep in order to accomplish our work and fulfill a bit of leisure. 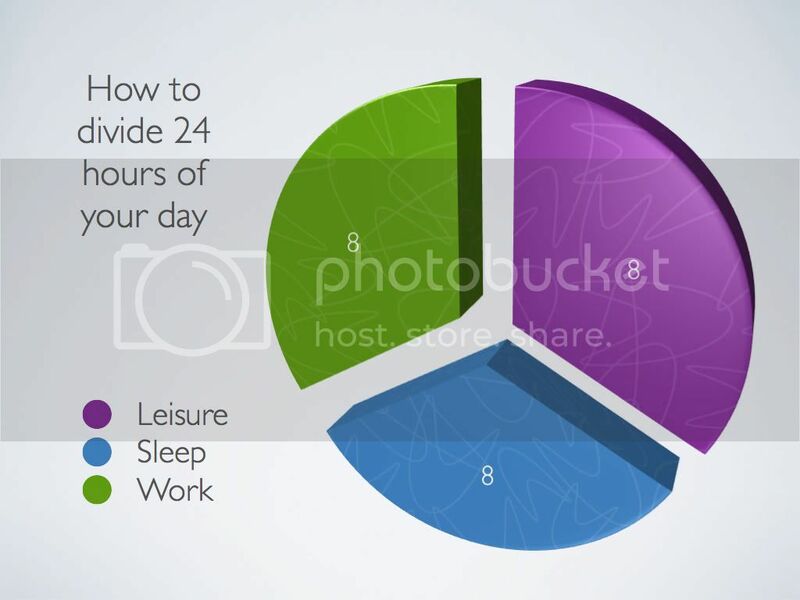 My friend theorized that if we can categorize our 24-hours into three 8-hour blocks specifically designated for work, leisure and sleep respectively, we will have better control of our time. If we can imagine 9am to 5pm being devoted exclusively to work and nothing else, we’d strive to finish everything within these 8 hours. With careful planning and discipline, we can aim to avoid unnecessary meetings and trivial water-cooler talks, stop engaging in social networks and sending junk emails, to finish our work within the 8 work-hours. The mind cannot function without a break, and leisure is important for the mind to recharge and refresh itself. It helps the mind to think laterally and be inspired with fresh ways of thinking, and to solve problems at work and at home. Catching up with friends after work also help to strengthen your social network, while reading books or watching a movie helps the mind to build upon new ideas or make sense of the world. You can also take this chance to visit the gym after work to keep the body in shape, which really helps to keep you healthy and your mind alert. The effect of sleep (or the lack of it) is well documented by psychologists and doctors everywhere, which is why it is important that we manage our sleeping hours and pattern. A good night’s rest energizes one to take on the world effectively and efficiently, giving you the ability to accomplish more within the 8-hour slot for work, and enough energy to enjoy the 8-hour leisure after work. And that is why it is important to keep the allocated hours of sleep and not sacrifice rest for work or leisure. The 8-hour theory may sound impossible to implement, because we have various obstacles that are external to us – such as unreasonable superiors, incredulous work load or family commitments. The 8-hour theory sets the framework for managing your everyday life, and to instill some discipline in the way we handle our time. Even if you feel you do not have control over your life or time, do not dismiss this framework outright. Try to work towards the 8-hour time block ideal, and see if you can organize the little things at work or at home to move towards the golden goal. There are many self-improvement books about time-management and goal-settings, which works in tandem with this theory to improve your life. Ignore such advice of time-management and goal settings at your own peril. It is your life after all – if you choose to dismiss such tools as hogwash, you will forever be inundated by work and other demands in life. If you choose you place into practice various techniques and strategies to improve your life bit by bit, you will be able to wrest back control – of your own life!